Police say they are still gathering evidence as part of their investigation into £10,580 that has gone missing from a Corby charity. Officers at Northamptonshire Police have been looking into the theft of the money from homeless charity Nightlight. The charity is presently based at the disused Corby Police Station in Elizabeth Street while it prepares its new premises in Cannock Road. 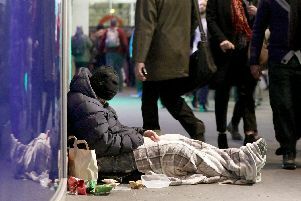 More than 30 people stayed at the shelter over Christmas amid an ongoing rough sleeping crisis in the town. The theft was reported to police at the end of November and it is now believed a portion of the cash has been returned to the charity by the bank. Chief Executive Officer Nicola Pell said last month that she had been ‘heartbroken’ at the theft and charity bosses pledged to continue to assist the authorities in their investigations. The Charities Commission also has their own, ongoing, probe after trustees reported the incident to them. A police spokesman said last night: “The investigation is ongoing and we continue to gather evidence.